Kern Steel – Kern Steel Fabrication, Inc.
KSF fabricated two complete Corporate Multi-Class DMD Complexes for the United States Navy to their strict design requirements. 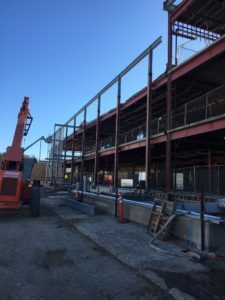 One was delivered to Portsmouth Naval Shipyard in Portsmouth, New Hampshire and the other was delivered to Puget Sound Naval Shipyard in Bremerton, Washington. 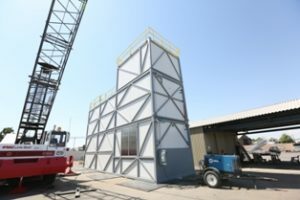 Modular, reconfigurable, and completely transportable submarine maintenance support structures can be stacked to 3 and 5 stories tall. They are equipped with remotely controlled actuation systems for tilting, raising, lowering and extending multiple platforms and skyways to satisfy the Navy’s requirements for submarine maintenance. KSF fabricated two complete Corporate Multi-Class DMD Complexes for the United States Navy to their strict design requirements. 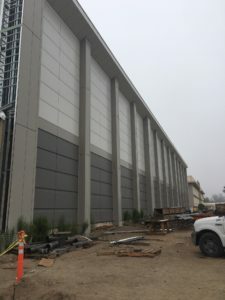 One was delivered to Portsmouth Naval Shipyard in Portsmouth, New Hampshire and the other was delivered to Puget Sound Naval Shipyard in Bremerton, Washington. 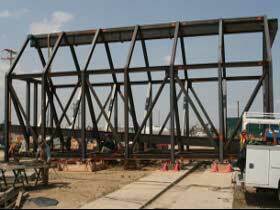 Modular, reconfigurable, and completely transportable submarine maintenance support structures can be stacked to 3 and 5 stories tall. 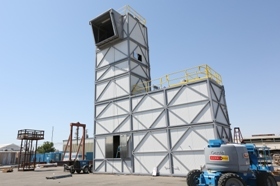 They are equipped with remotely controlled actuation systems for tilting, raising, lowering and extending multiple platforms and skyways to satisfy the Navy's requirements for submarine maintenance. Contractor: Harris Construction Co. Inc. 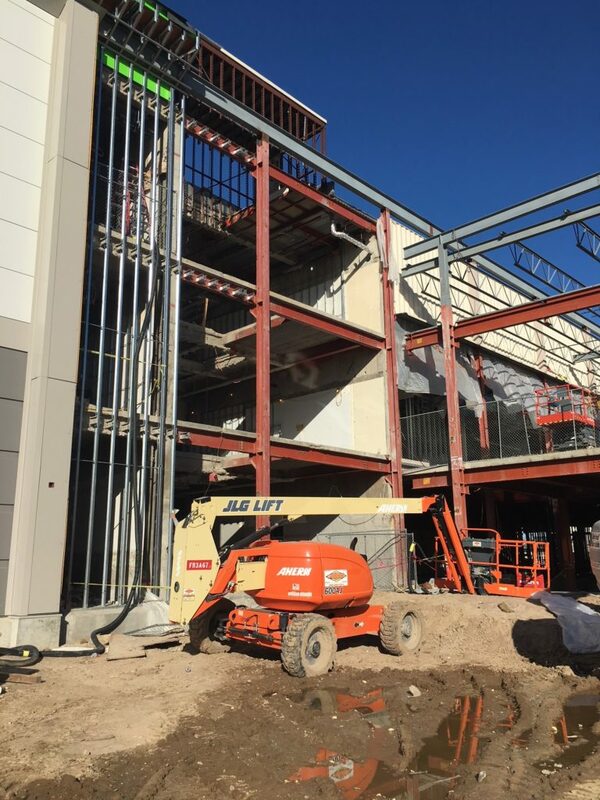 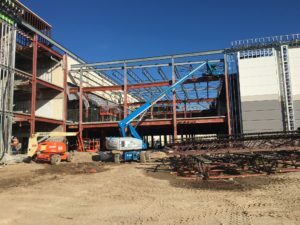 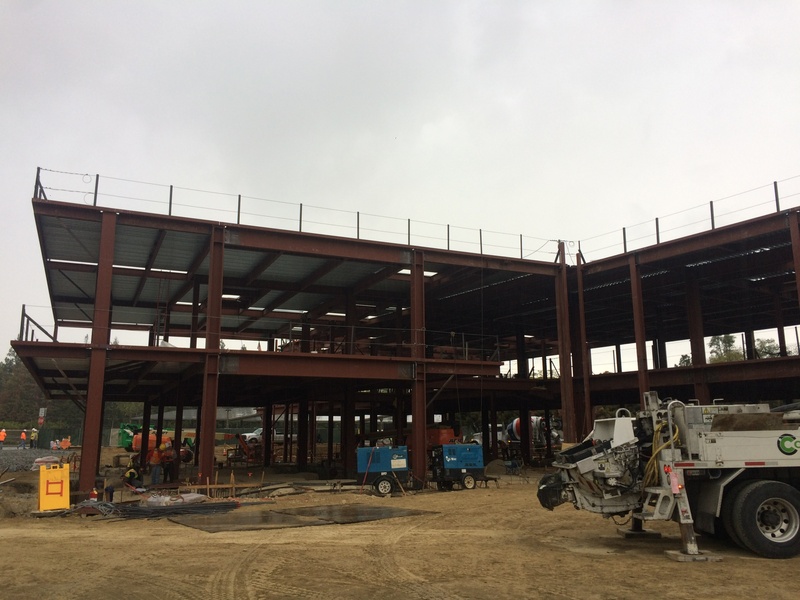 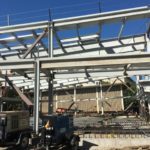 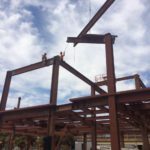 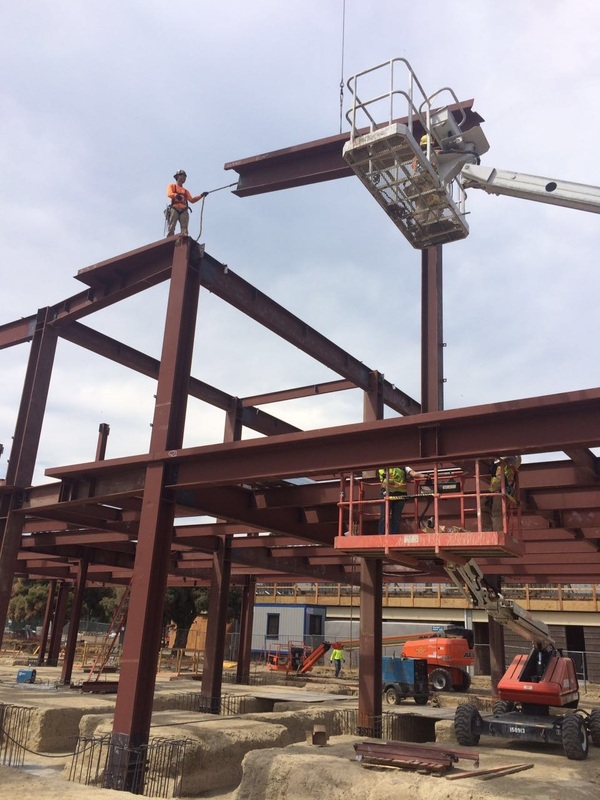 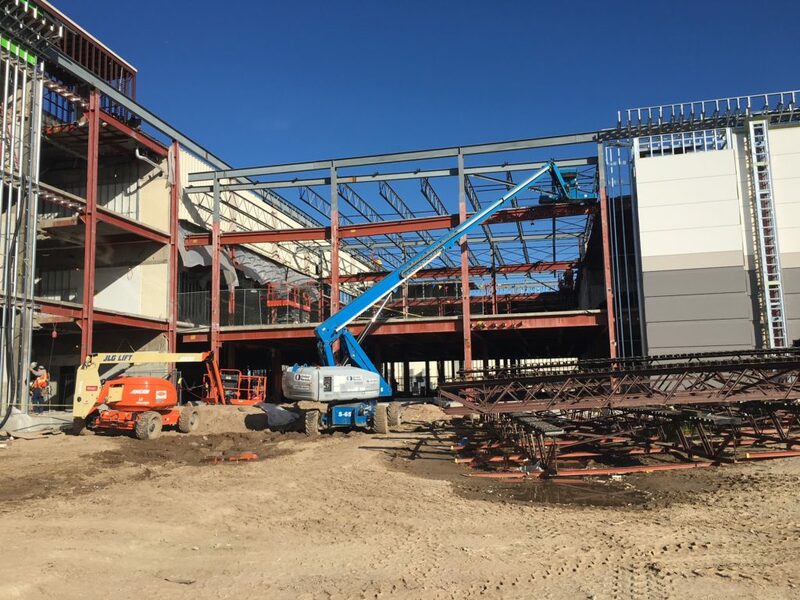 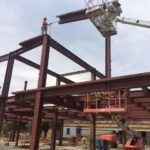 This job consisted of stainless steel plate flooring, a continuous stair over 100 feet tall with stainless steel railing, numerous precise floor openings to receive large equipment, and complex exoskeleton structural steel design and placement. 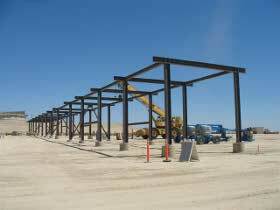 This project included fabrication of 26 pipe racks for Berry Petroleum's new water plant at the North Midway Sunset Oilfield near Fellows, CA. 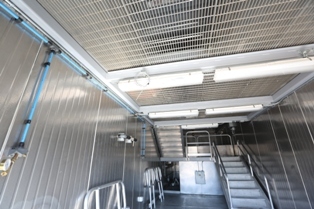 KSF fabricated 28 mobile Self-Contained Fuel Systems for the military, complete with assembly, systems installation and operational testing of the fuel delivery systems. 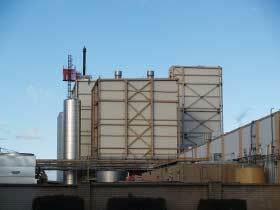 We also performed the blasting and coating on these units. 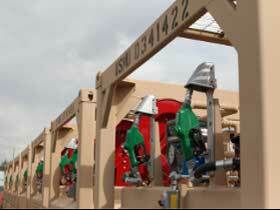 The Fuel Systems are stackable, capable of being daisy-chained, and can fuel two vehicles at the same time at a very high fuel delivery rate. 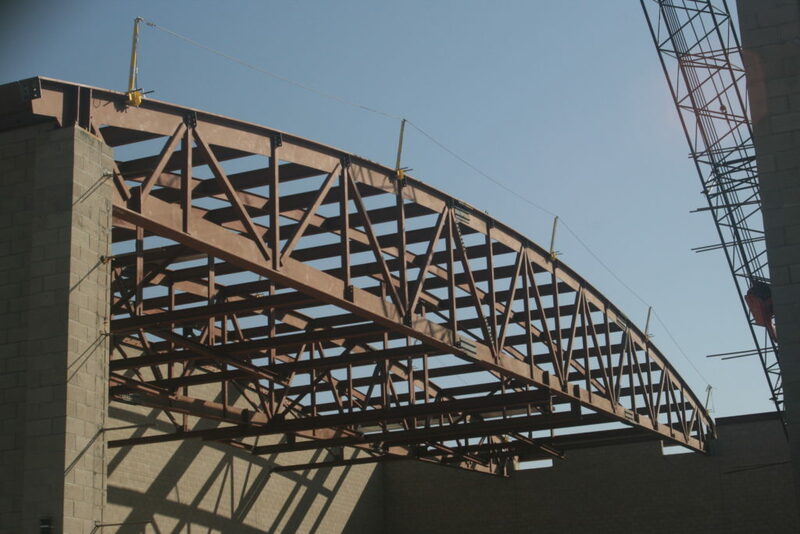 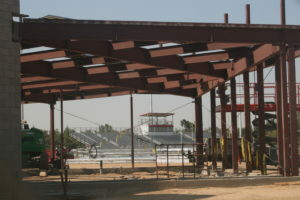 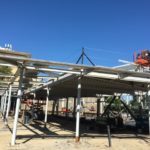 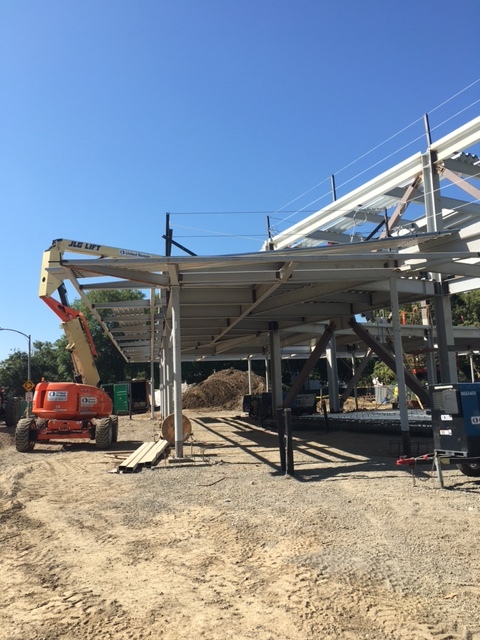 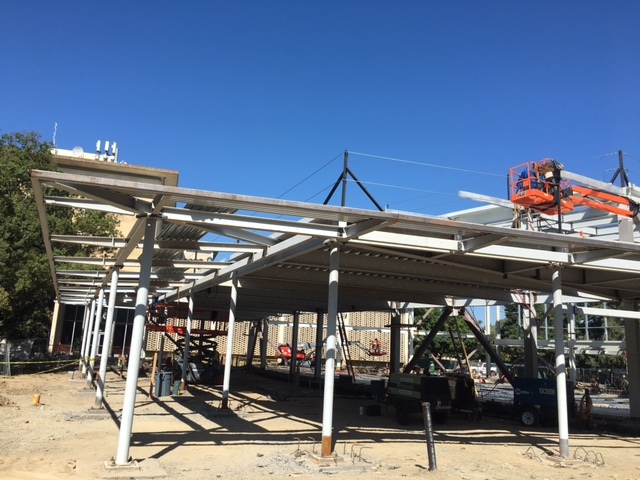 This heavy tube-steel carport structure has spans of 40 and 60 feet. 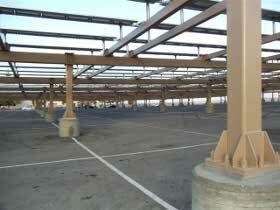 It supports a 1-Megawatt Solar Array that tracks the sun throughout the day. 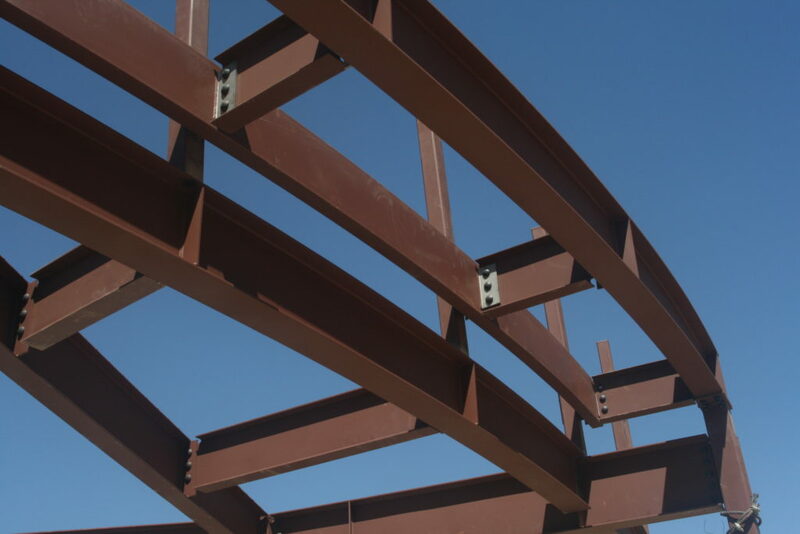 The array is supported by 1,000 posts that had to be precisely aligned and attached in our fabrication facility. Visit Kern Solar Structures for more solar steel projects. 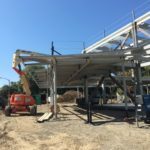 Contractor: Global Green Solutions Inc.
Project included fabrication and assembly of a specialized Doffing Roll Unloader and Fuel Crib used to offload and store biomass product at a prototype biomass energy plant. 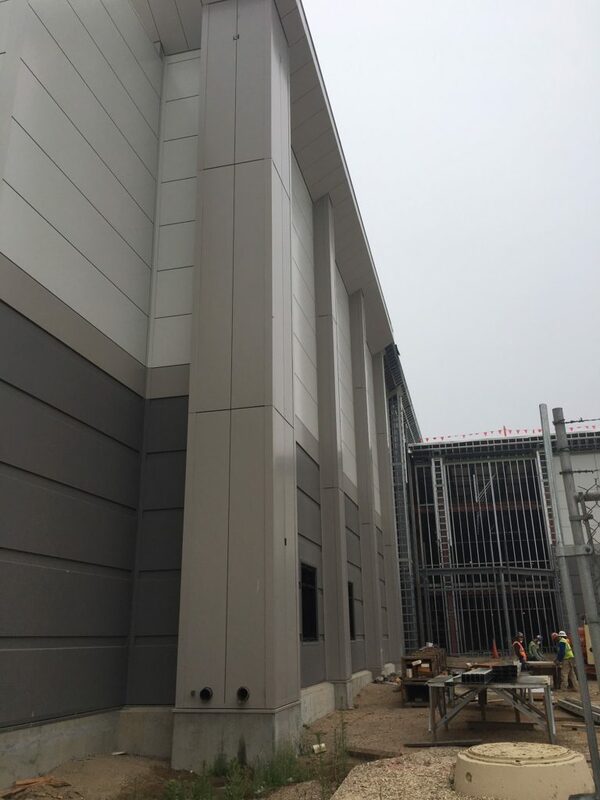 Additional items fabricated for this project included various platforms, support structures and a complex combuster windbox assembly. 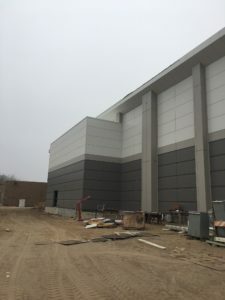 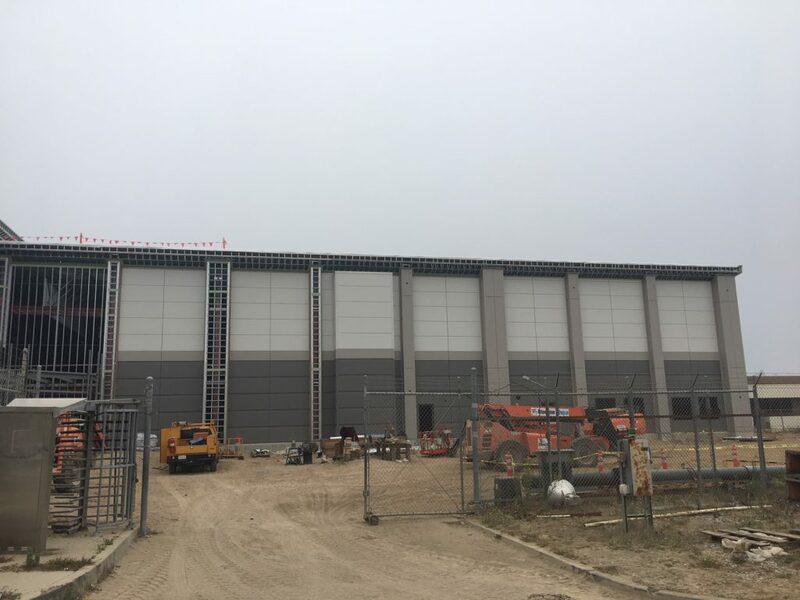 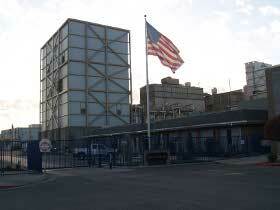 This project contained some logistical challenges because it is on an active Air Force Base. 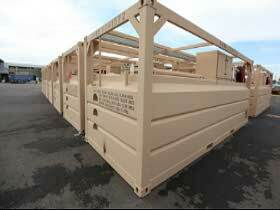 Security is a concern and all personnel and deliveries must be checked and cleared before entering the base. 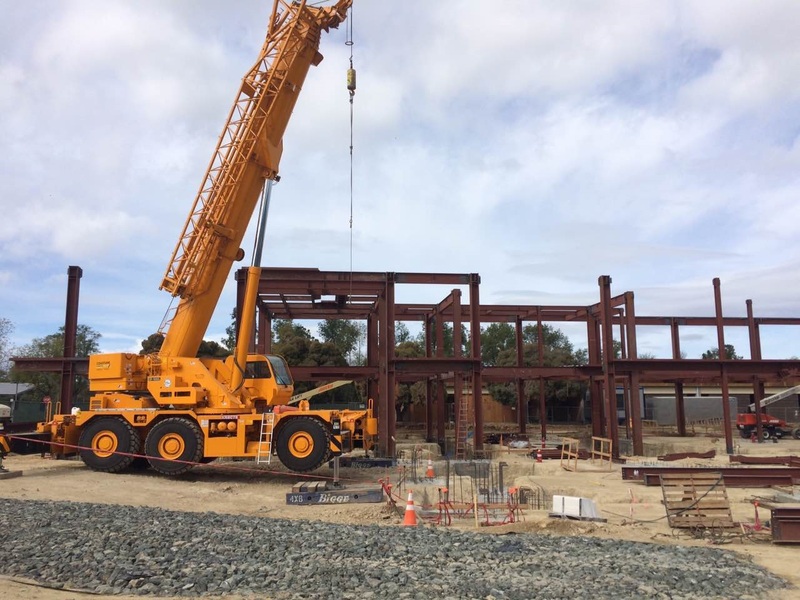 There are certain times when crane operations were prohibited due to rocket launches from nearby launch pads. 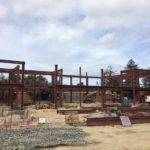 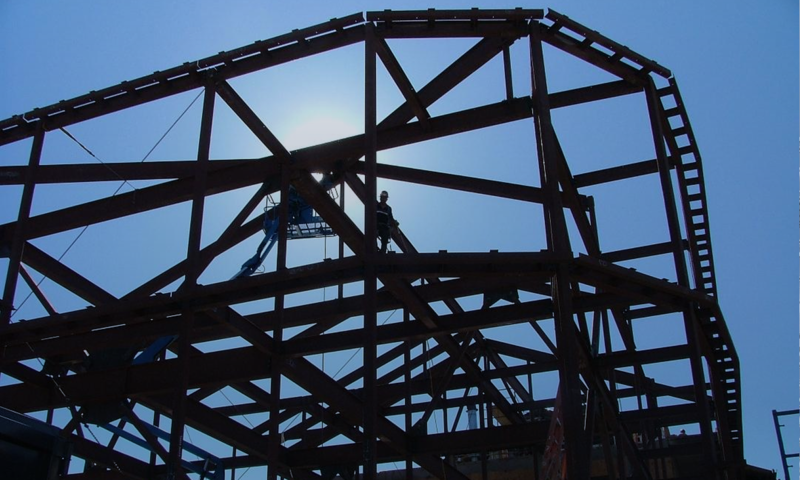 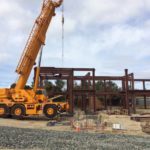 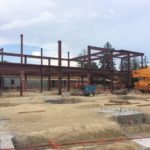 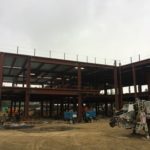 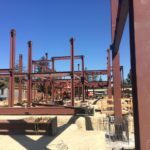 Because the project is renovating an existing building all site conditions had to be verified and measured before any detailing, fabrication, or installation of structural steel and misc. metals could take place. 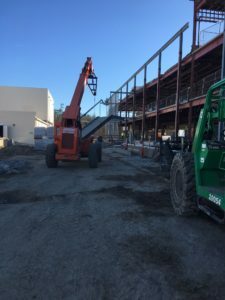 Coordination with the general contractor and with other trades is critical because only certain areas of the building are available to be worked on due to demolition, lead abatement, or ongoing work by others. 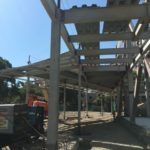 • 2nd and 3rd floor concrete deck that was actually 7” thick as opposed to 5” thick as shown in the plans resulting in revisions to the supports and attachments of new stair flights. 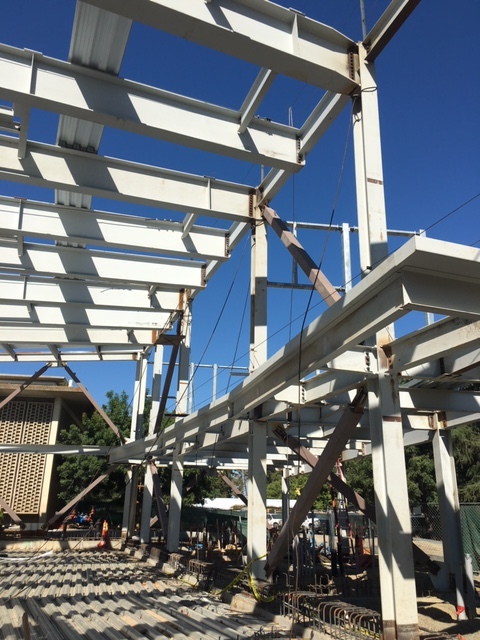 • Mechanical penthouse steel that was rusted through requiring replacement of 90% of the steel framing as well as requiring additional new roof support beams below. 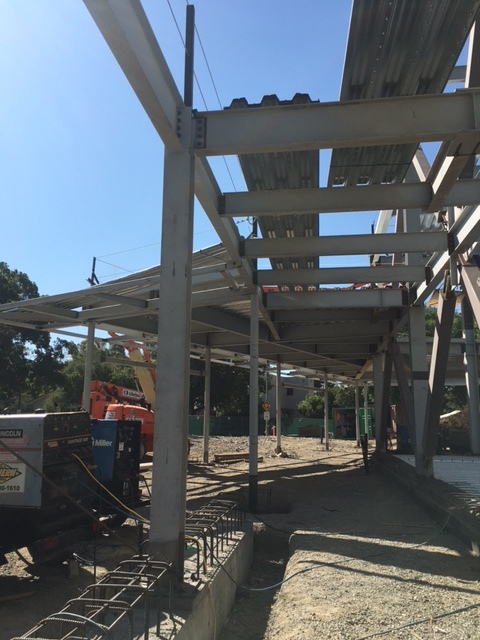 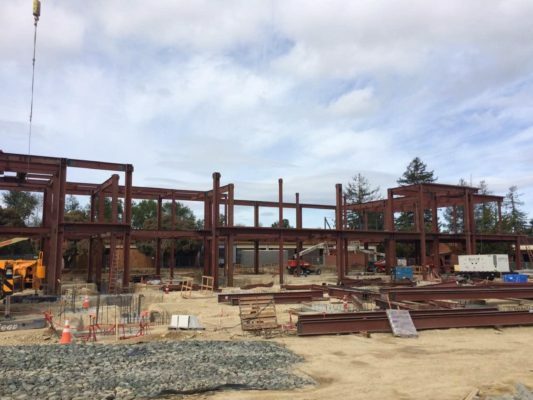 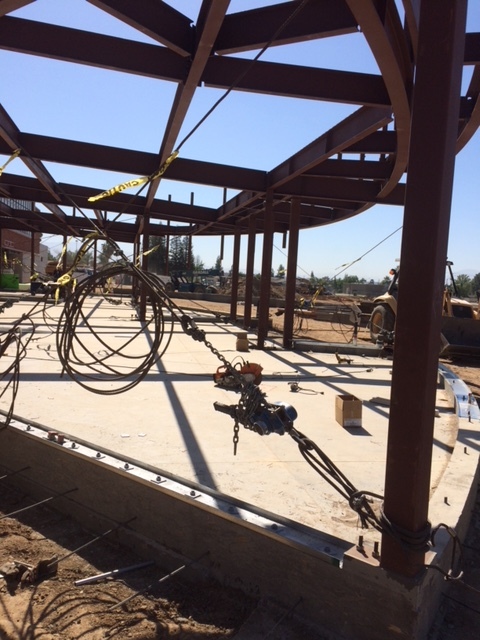 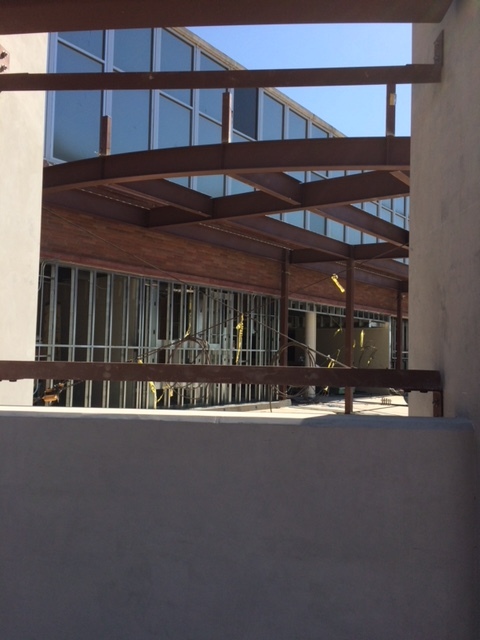 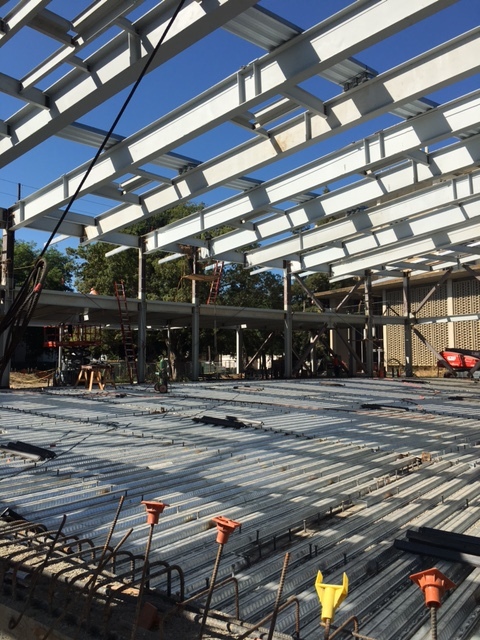 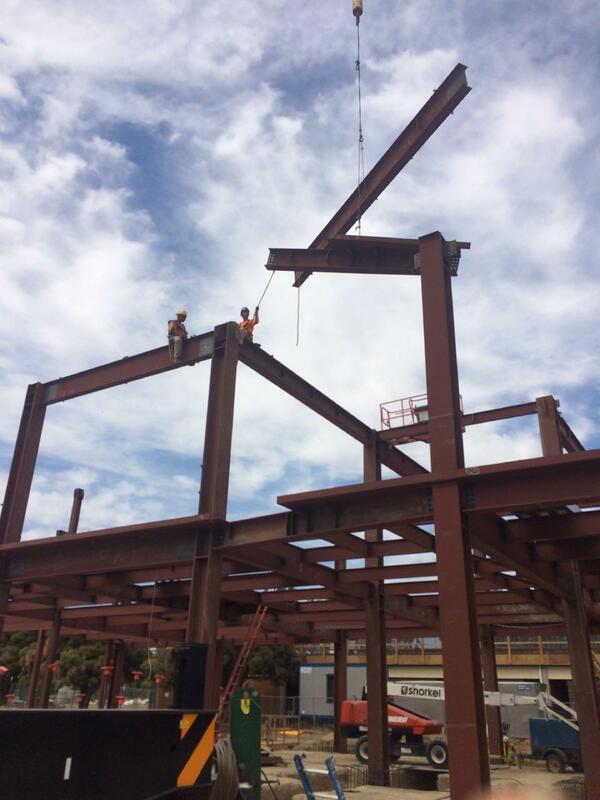 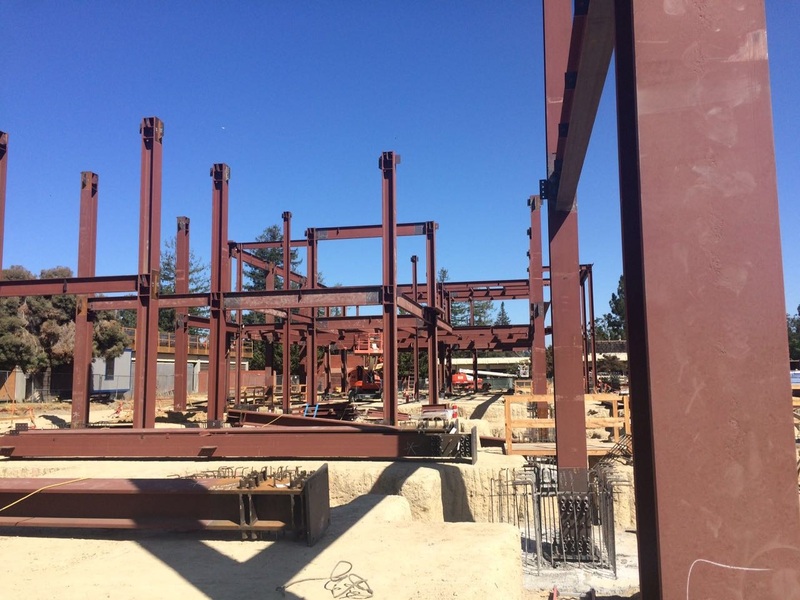 • Existing building columns that were as much as 2” out of plumb requiring new perimeter roof beams needing to be offset and field welded in lieu of bolted to allow for proper alignment. 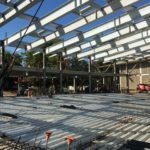 This project contains some logistical challenges because it is on a very tight site in the middle of an active University Campus. 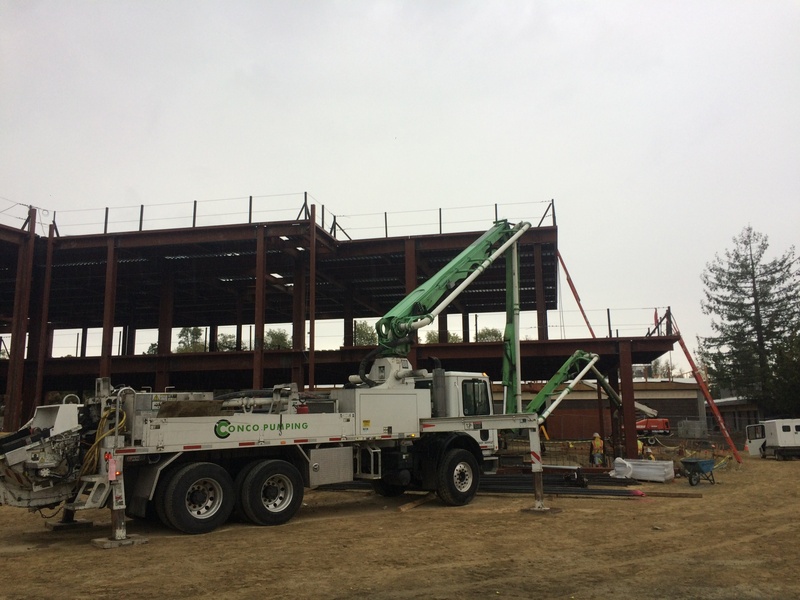 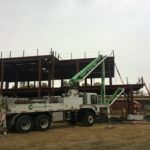 Deliveries had to be coordinated precisely because there are only specific times trucks can be received and the jobsite was not large enough to allow for all the steel to be delivered and shook out. 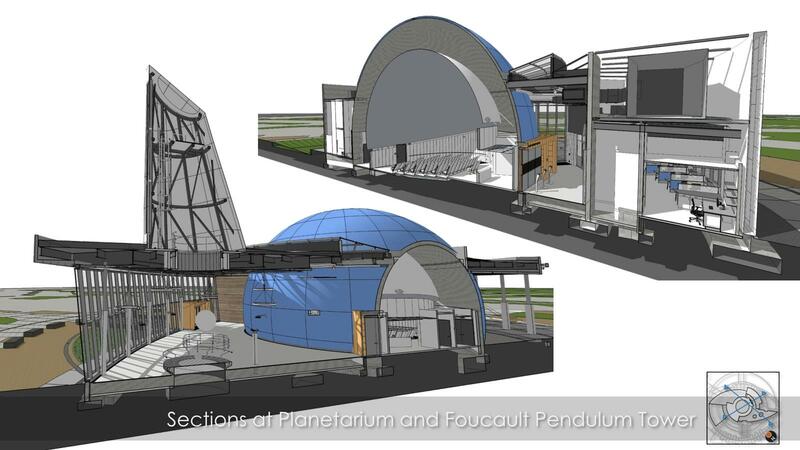 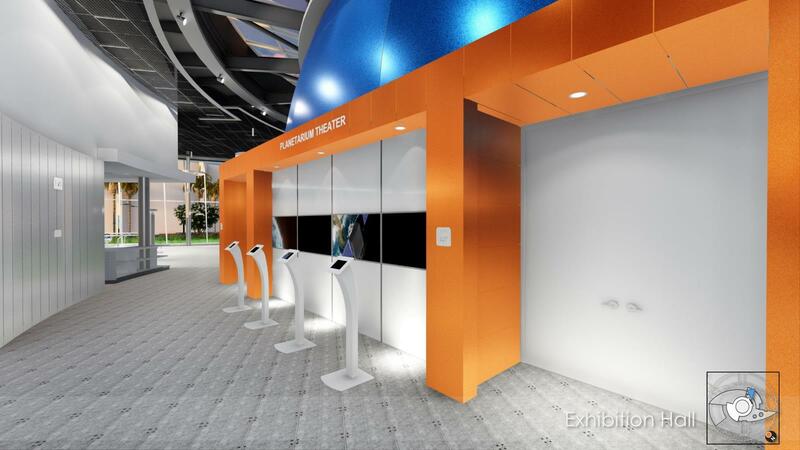 This project also included design and engineering of a mock-up structure that needed to incorporate many of the structural conditions found in the lecture hall building scaled down into a very small footprint. The mock-up structure was used by the design team to test the buildings finishes ensuring that moisture and wind would not affect the building. 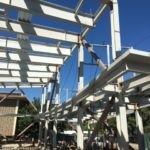 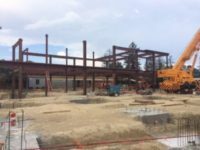 AESS components were also a crucial part of the structure since there are numerous steel columns, cabana beams, and eyebrow features that are exposed in the final construction. 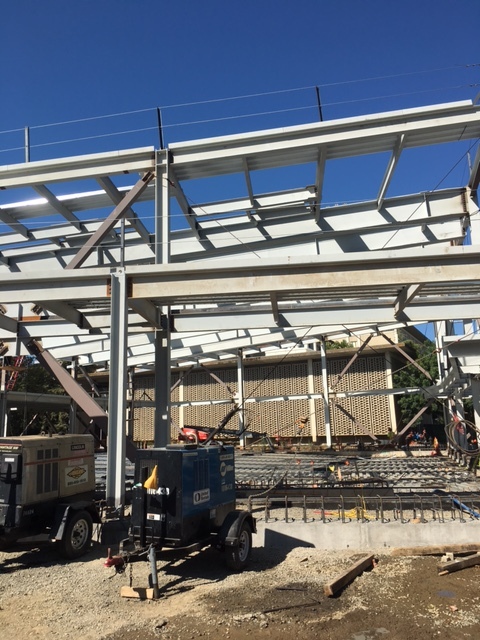 Location: McKittrick, CA Contractor: Global Green Solutions Inc. Project included fabrication and assembly of a specialized Doffing Roll Unloader and Fuel Crib used to offload and store biomass product at a prototype biomass energy plant. 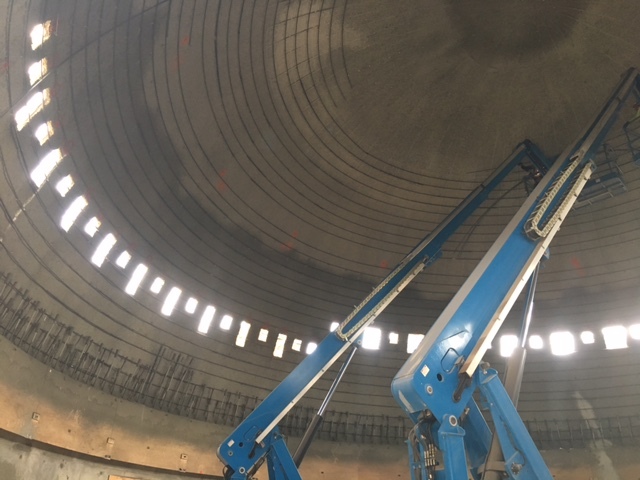 Additional items fabricated for this project included various platforms, support structures and a complex combuster windbox assembly.